The Workshop is based around learning dance sets and gaining knowledge about competing as a crew on stage. This Workshop is suited to exerienced and non-experienced participants. The key to this workshop is to learn and have fun! 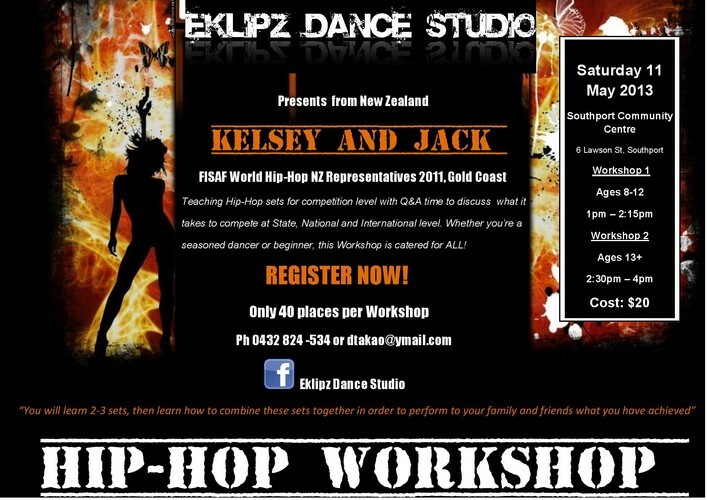 Tutors Kelsey and Jack are coming from New Zealand to run the Workshops. They both are former members of Eklipz 002 Crew, who represented NZ at the FISAF World Hip-Hop Competition on the Gold Coast in 2011. They bring a wealth of knowledge to share with participants. Please note: There are two Workshops with the 8-12 year olds first and 13 year olds second. Please advise which Workshop you will be attending. Only 40 places per workshop.